As you may or may not know, if you grow up in Hawaii, you end up eating rice with everything. Since I’ve lived in Hawaii for nearly 34 years, it’s tough to break the rice habit. I was able to do that in 2007, but that was like a freakish miracle. 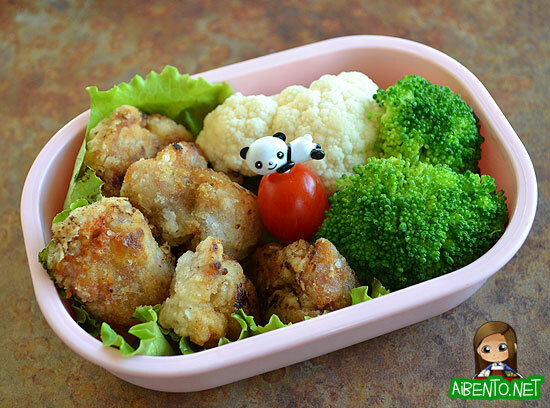 I tried to do it with this bento and replaced the rice with veggies. It helped a lot that I just didn’t have cooked rice on hand, hahaha! I cut up a chicken thigh, salted and peppered it, coated it in potato starch, then fried it in olive oil until brown. I hate frying chicken in potato starch because it takes FOREVER to get the chicken brown. Maybe that’s why every time I eat chicken karaage, it’s really hard and tough from being fried so long? In any case, it was yummy, but I didn’t salt it enough. Usually you marinate the chicken in sauce, but I was lazy and this did just fine in a pinch. I plopped in boiled broccoli, raw cauliflower, and a cherry tomato from the yard with a cute little panda food pick in it. A small lunch, but I brought a lot of fresh fruit snacks with me to work to help tide me over! It’s only day 2 of losing weight and eating healthier, but I’m still going!